The smallest of the matching tables that I used in the Man Cave was just the right size to become a foot stool. Once I painted the table, I put together a quick and simple cushion to tie on top. 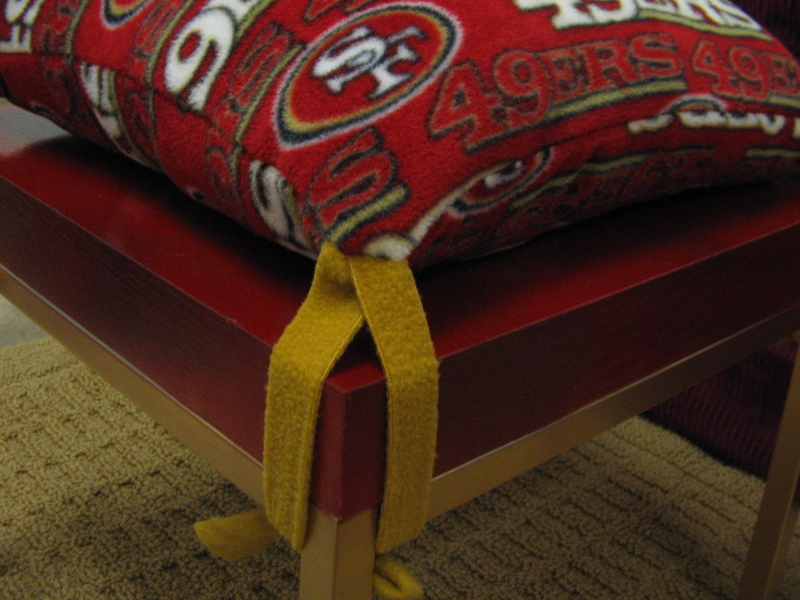 Using the top of the stool as your guide, cut out the two pieces of fleece that will become the top and bottom of the cushion, making sure to allow extra around the edges for the seams. My stool measured 15″ square, and I cut 16″ square pieces. 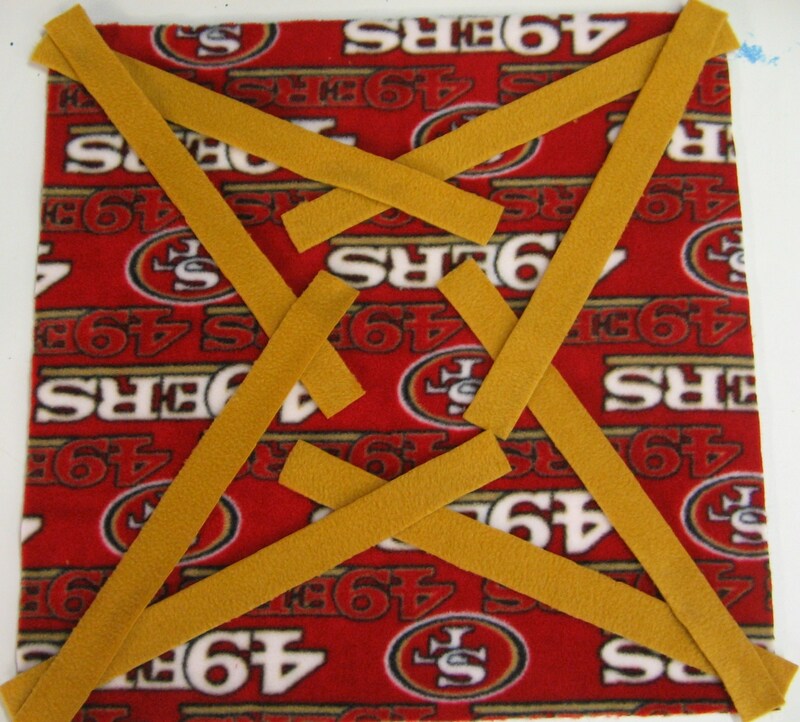 Since I wound up sewing a 3/4″ seam, I should have probably at least cut a 17″ square. As you can tell in the finished piece, the cushion still wound up being a little too small. 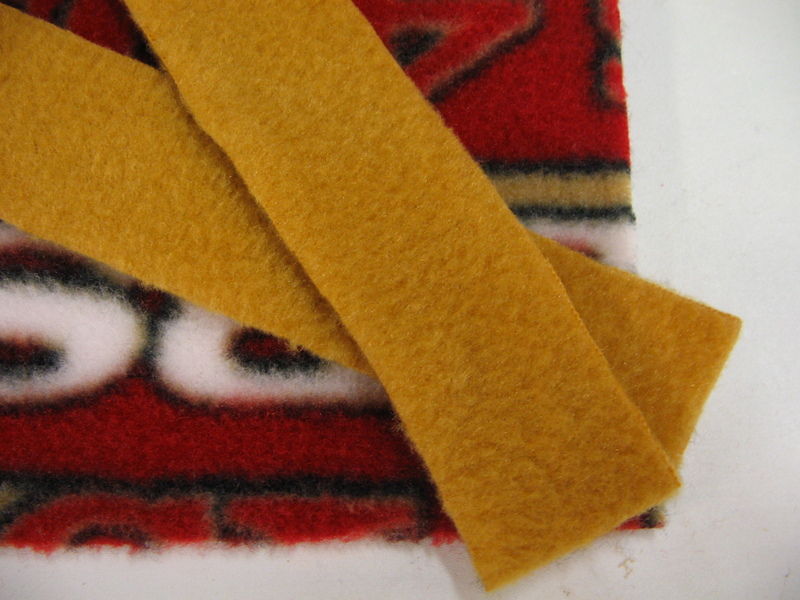 After you cut your two squares, cut 8 strips of fleece that measure 12″ long and 1″ across. These strips will become the ties that attach your cushion to the stool. You can adjust the length of your strips depending on how tall or short your stool top is. Lay one square of fabric face-up on the table. 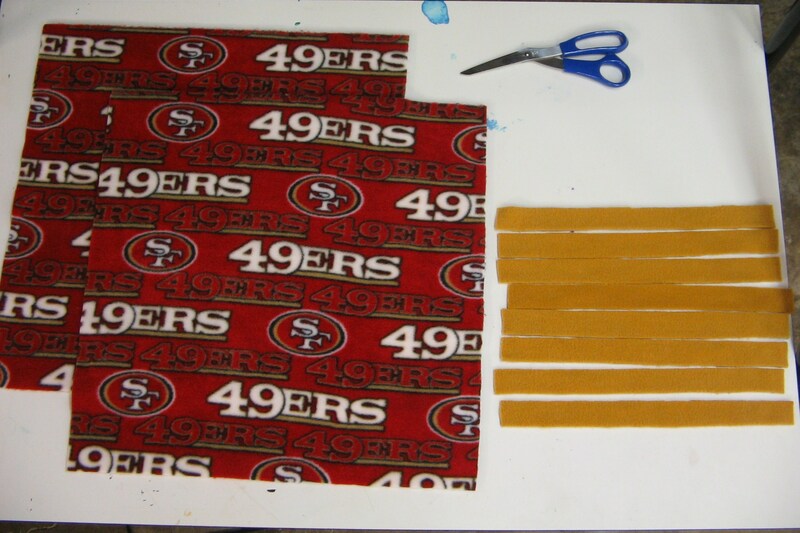 Arrange the strips as shown in the picture, making sure to cover the corners of the square. It doesn’t matter how the strips are layered in the middle of the square. The important part of this arrangement is how the strips meet up with the corners of the square. The corners are the most important area. Here’s a close-up on a corner. Place the second square face-down on top of the first, matching the edges. Pin the fabrics together around the edges, making sure to secure the ties well. Beginning in the middle of one of the sides, sew all the way around the square until you make it back to about 4 or 5 inches away from where you started. 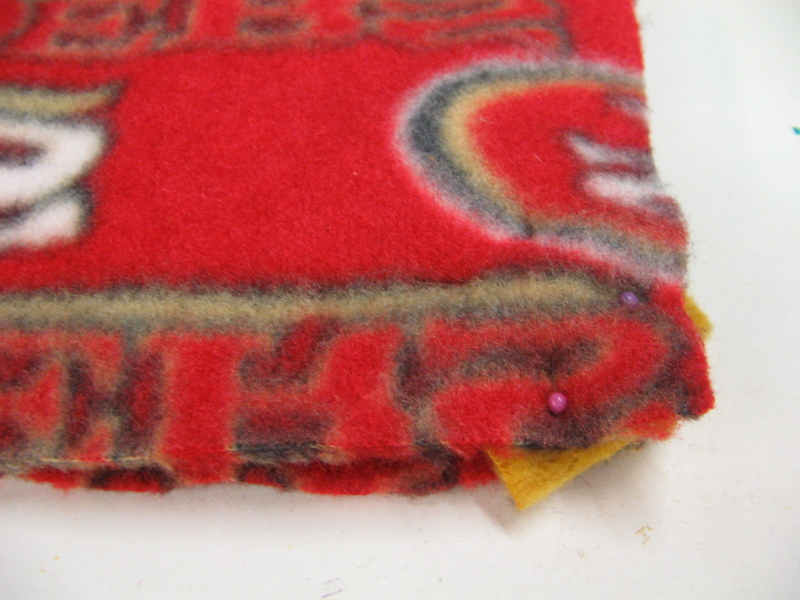 Secure your thread, and then turn your cushion right side out through the hole. Your ties are now on the outside, hanging from each corner. 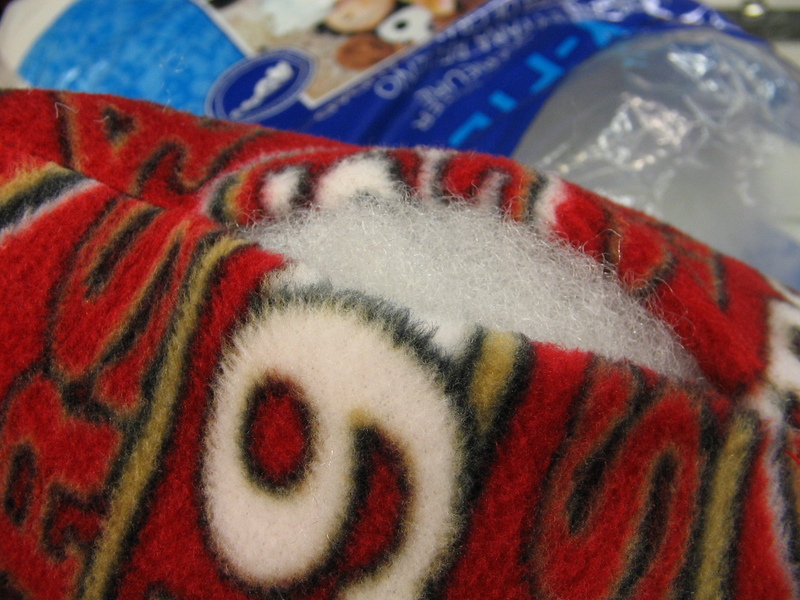 Stuff your cushion with the fiberfill, and sew it closed by hand. And that’s it! This is a very easy project that can be completed in under an hour. Now, all you need to do is tie the strips around the legs of your stool, and you’re ready to sit back, prop up your feet, and relax. Kick up your feet. You know you want to.